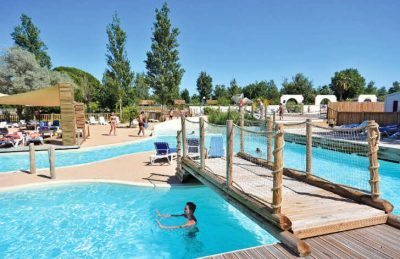 Le Mediterranee Plage is a 4 star campsite located in Vias-Plage in the Languedoc region of France. Le Mediterranee Plage is a large family friendly campsite that occupies a truly wonderful location along the Mediterranean coast. A exceptionally well maintained campsite, Le Mediterranee Plage has been beautifully landscaped with plenty of colourful plants, trees and shrubs and many of the pitches are tree lined to provide a degree of shade and privacy. The campsite is highly popular with those families who prefer not to drive to the south coast of France and who would rather fly. Beziers airport is just 12km away from Le Mediterranean Plage making it an easy car free holiday location. There are regular flights from London, Bristol, Edinburgh and Manchester to Beziers. Portiragnes-Plage is the closest resort to Le Mediterranee Plage and offers a fabulous array of bars, restaurants and shops to explore. If you’re a sun worshiper or beach lover then you really can’t go wrong with a holiday at Le Mediterranee Plage. Direct access to a fantastic beach means that you don’t have to travel far to get your fix. You can literally smell the ocean from the campsite and the beach is long and great for families of all ages, with plenty of space to relax and have fun. If you’d rather stay on site and take advantage of the pool when others are at the beach then you won’t be disappointed. A wonderful spacious pool complex awaits you with plenty of sunbathing areas surrounding the two large lagoon styled swimming pools. You’ll also find that the pool complex has some slides to ensure that the whole family have enough to keep them busy. Le Mediterranee Plage is a large campsite with an equally large number of activities and facilities on offer to ensure you have a fabulous holiday. On site activities at Le Mediterranee Plage campsite tennis, table tennis, football, basketball, volleyball, archery, boules, mini golf, pony rides, playgrounds, cycle hire and also a fabulous farm animal area with goats, pigs, geese, chickens and ponies for children to play with. Facilities available at Le Mediterranee Plage campsite include WIFI, restaurant, snack bar, takeaway, bar, groceries, animation team, washers and dryers. Accommodation at Le Mediterranee Plage includes a range of 2 and 3 bedroom mobile homes that are available from Eurocamp. Click the button below to book your camping holiday in France with our travel partner, Eurocamp. Special offers, competitions and more in our monthly newsletter! Go Camp France is the perfect destination for families, groups, couples and individuals who are looking to book a campsite and camping holiday in France. We feature independent French campsites and leading holiday companies who specialise in providing camping holidays in France. Choose from pitch only camping, luxury tent, mobile home, chalet and bungalow accommodation. Go Camp France is a product of Westcountry Travel Ltd. Registered in England: 11010037. All rights reserved.